Chinese food may be tasty, but more often than not it’s an ab-killer. We asked Jim White, R.D., a Virginia-based dietician, to help us make some smarter choices. Chopsticks are your friend. “You’re going to get less oil than you would with a fork,” adds White. Steer clear of thick gravy or sauces made from sugar, flour, or cornstarch (such as those found on General Tso’s or Sweet and Sour Pork). They’re loaded with corn syrup. Instead, White suggests hot mustard sauce, hoisin sauce, or oyster sauce. And no matter what, always make your order “half sauce.” That way, you get half the sauce—and half the calories—of what they’d normally use in the dish. Here’s an inside tip: Order your meal cooked in vegetable stock (a traditional Chinese style of cooking called “stock velveted”) to reduce the calories in your dish by 150-300 and the fat by 15-30 grams. “Expect your protein to be a bit more moist and tender, with less crunch than usual,” says White. 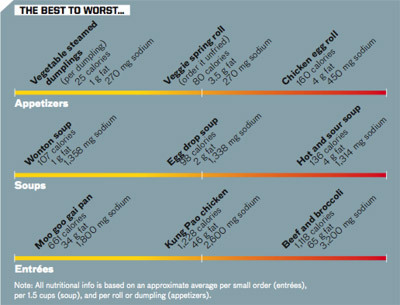 Fried rice is undeniably bad for you, setting you back 450 calories and 14 grams of fat. Brown rise is better, with only 215 calories and a generous 3.5 grams of fiber per cup. 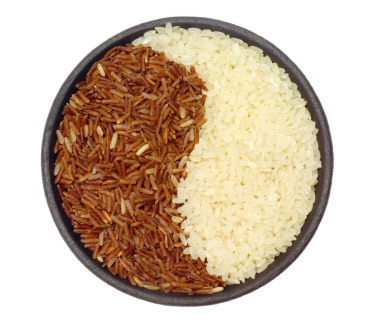 But even though it’s trendy to avoid white rice because it’s a high-glycemic carb, it’s not so bad. “Calorie for calorie, they’re about the same,” says White. You do lose the fiber, though (only a gram in a serving), and you get hardly any vitamins at all. Still, it’s definitely not as bad as it’s been made out to be.